100 Metre Radius is a networking and professional development project that invites artists and organised groups from Johannesburg and beyond to imagine ways to utilise the Drill Hall, a historic site located in Joubert Park, as a cultural and social infrastructure. Since Keleketla! Library’s programmatic take over from the Joubert Park Project over four years ago, audio and music took the centre stage as one of the core programmes for professional development, networks and platform for expression. Fittingly so, as Joubert Park is one of the most sonic environments in the Johannesburg inner city. But there is more, while the Drill Hall is historically well known as a military barrack and the site for the 1956 Treason Trial hearings, very little is known of the Treason Trial Drill Hall choir of 1956 and the very popular dance contests that took place at the site in the late 70’s. Today, the Drill Hall is a host to some of Joburg’s best experimental bands and dance practitioners. In engaging with this past and present, the Keleketla! Library commissioned young printers, musicians and choreographers to work with youth towards a public concert. 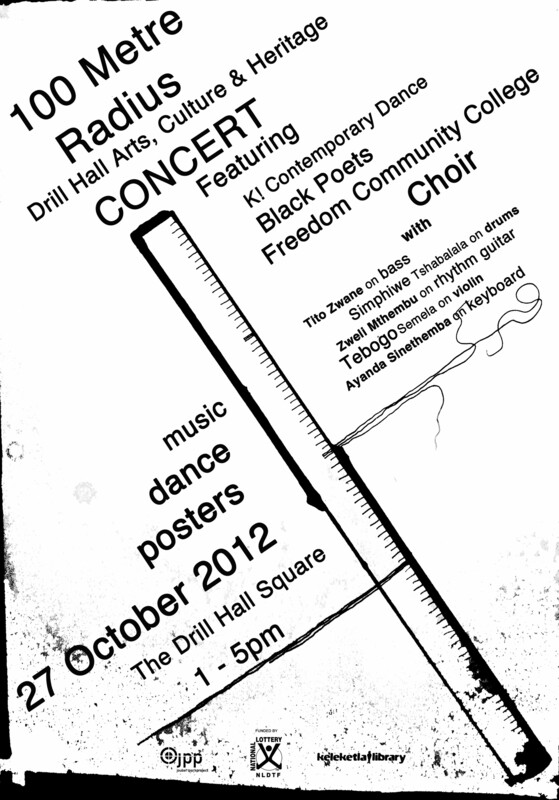 Performing revisions and alternative experiments on liberation struggle songs and contemporary choral music. Keleketla After School programme members in music rap on anything but the negative: xenophobia, education, violence and heritage. With hit tracks such as Heritage and Super Youth at some schools in the city and on SoundCloud, Black Poets are an outspoken trio with origins in Mozambique, living, learning and rapping in Johannesburg. Keleketla After School programme members in dance come full circle as they return to their earlier production titled Movement Mandela, then under the choreography of Mike Machaya. Performed for the first time on the occasion of a Q & A session with Ahmed Kathrada, the dance piece on the violent arrests of struggle heroes featured Tito Zwane, Zweli Mthembu and Simphiwe Tshabalala on sound and Thenjiwe Nkosi on video. This piece brings new choreographer Mpho Molao with most of the original members, this time with a choir. The posters reflect and use visual references from the choir and dance projects, Medu style, with text that speaks of the now. Under the creative direction of Fananathi Media’s Tshepo Rakosa, Bravie Zondo and Donald Thobela are creating striking silkscreen editions.